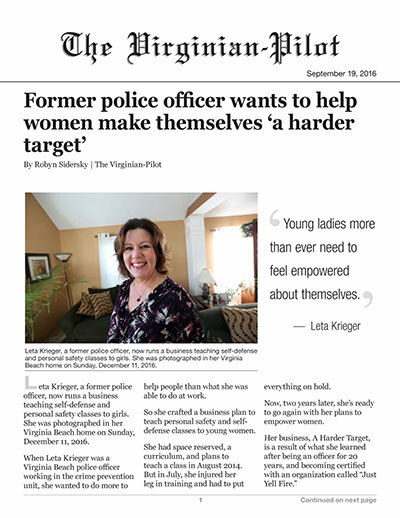 When Leta Krieger was a Virginia Beach police officer working in the crime prevention unit, she wanted to do more to help people than what she was able to do at work. So she crafted a business plan to teach personal safety and self-defense classes to young women. She had space reserved, a curriculum, and plans to teach a class in August 2014. But in July, she injured her leg in training and had to put everything on hold. Now, two years later, she’s ready to go again with her plans to empower women. Teaching the community about personal safety was one of her favorite parts of working in the crime prevention unit. “Crime prevention is training and educating people to be the eyes and ears of the department,” she said. When she was a detective, she would hear stories about young women getting themselves into bad situations, and she wanted to help prevent that from happening. She started her business to bolster the efforts of the department. When she found the “Just Yell Fire” curriculum, it was a good fit. She spent her own money and took personal time to go to Florida and train. What resonated with her was that the techniques were easy to learn, easy to remember, and effective. There was a lot of emphasis on dating violence prevention, a cause she cares deeply about. “I love the idea of empowering young girls,” she said. She caters her classes to specific groups, such as young women going off to college, or teenage girls, or women in the workplace. Her 16-year-old daughter has had lessons drilled into her head her entire life. She recalled a time when her daughter and a friend were allowed to walk their puppy around the block when they were 5 years old. They were supposed to be back in 10 minutes. After more than 20 had passed, Krieger – then a police officer – started getting worried. She couldn’t leave home because her son, then a baby, was asleep. She called the dad of the other child, who said he knew they were down at the duck pond and safe. He went over to pick them up, but her daughter refused to get in the car. She recalled her mom telling her not to get in the car of someone she doesn’t know. Even though she was 5, the lesson stuck. The dad ended up following her home in his car, because she insisted on walking. After Krieger’s injury, she said she lost her mojo a little, after going through physical therapy, and other obstacles that slowed her down. In February 2016, she retired from the force. But people kept asking her about her self-defense classes and some of the enthusiasm came back. Now she has a class planned for January. The holidays are a busy time for everyone, so she’s waiting until the dust settles and people are back to their normal routines. She hopes her class will spur more interest in what she’s teaching. She is willing to provide customized classes for groups. In her class, she’ll teach situational awareness, how to carry yourself and how to prevent something bad from happening. She’ll also teach about 10 techniques that are easy to remember. It’s not simply a martial arts class, though, she said. “The classes are fun, not intimidating,” she said. You don’t have to be big and burly for them to be effective, either. Being able to tailor the classes is part of what makes this new endeavor so attractive to her. “What you teach has to be applicable to their daily lives,” she said. It gives her flexibility she didn’t have when she was an officer. She called her business “A Harder Target” because that’s what she wants the people she teaches to become. “You make yourself a harder target for criminals” she said, with some training.